These Bacon Wrapped Shrimp are a quick and simple appetizer, perfect for holidays, game day or parties. Just wrap shrimp and jalapeño with bacon and fry it up. These can also be made Whole30 – Paleo compliant. 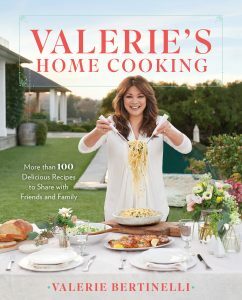 I received a copy of Valerie’s Home Cooking to facilitate this post. I have a tricky relationship with shrimp. I used to be obsessed with shrimp, could eat it by the bucketful. After my pregnancy I was unable to eat shrimp for . . . years! I still can’t even look at an oyster. These sudden taste changes can happen, especially after pregnancy. Mine has more of a backstory. Unaware of my pregnancy I went on my annual New Orleans vacation. Usually I would spend those ten days eating shrimp, oysters and crawfish like my life depended on it. But this particular trip everything I ate (and drank) seemed to not agree with me. By the time I returned home to California I was beyond sick. I thought for sure it was food poisoning or the swine flu ← this happened during the year of the swine flu. It wasn’t. It was ‘morning sickness’. So now when I eat shrimp it has to have other flavors. Gone are the days of me enjoying a bucket of boiled shrimp. These Bacon Wrapped Shrimp are exactly what I need. A simple flavor combo of shrimp, bacon and jalapeño. Plus, I was able to make these Whole30 Paleo compliant. Win! 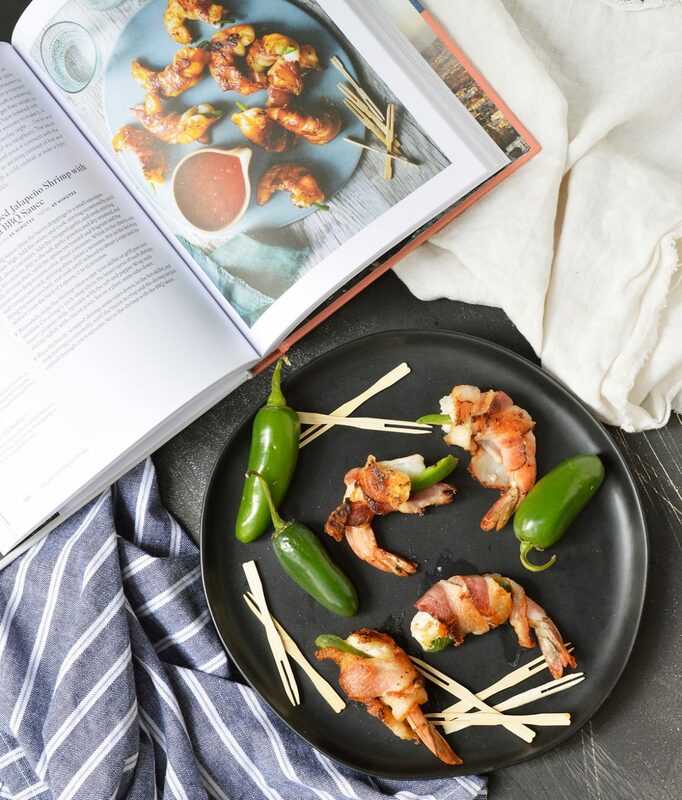 This Bacon Wrapped Shrimp Recipe is from Valerie Bertinelli’s new cookbook, Valerie’s Home Cooking. This cookbook is filled with easy, tasty family recipes. There are more than 100 recipes to share with family and friends. The recipes are unique and flavorful, like Bacon-Caramel Scuffins with Caramel Clotted Cream, Lobster BLTs, Spicy Arrabbiata Penne and Lemon Raspberry Panna Cotta. The wonderful recipes are accompanied by beautiful photos. These Bacon Wrapped Shrimp are a quick and simple appetizer, perfect for holidays, game day or parties. 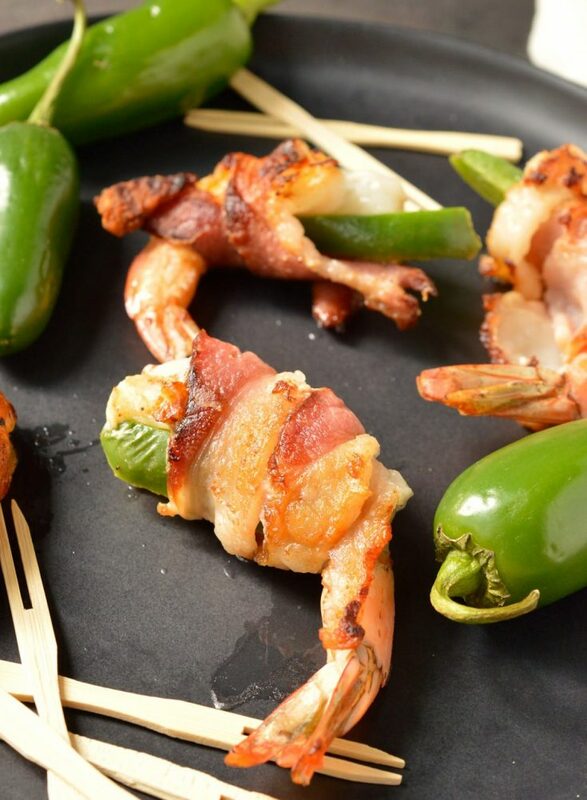 Just wrap shrimp and jalapeño with bacon and fry it up. These can also be made Whole30 - Paleo compliant. Heat a skillet or grill pan over medium. Cut a long 1/4-inch-deep slit in the inner curve of each shrimp; insert 1 jalapeño strip. Sprinkle with the salt and pepper. Wrap each shrimp tightly with 1 bacon piece. Set on a plate, seam sides down. 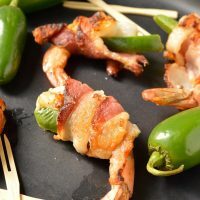 Place the bacon-wrapped shrimp, seam sides down, in the hot skillet, and cook, turning occasionally, until the bacon is crisp and the shrimp are just cooked through, 5 to 6 minutes.